Betterment vs. Vanguard Personal Advisor - Which Robo-Advisor is Best for You? YOU ARE HERE:Home » Betterment » Betterment vs. Vanguard Personal Advisor – Which Robo-Advisor is Best for You? Choosing between robo-advisors can be very hard when you’re stuck between two well-known, strong contenders. Betterment vs. Vanguard Personal Advisor Services is a particularly difficult choice, as both robos have human financial professionals available to their clients. 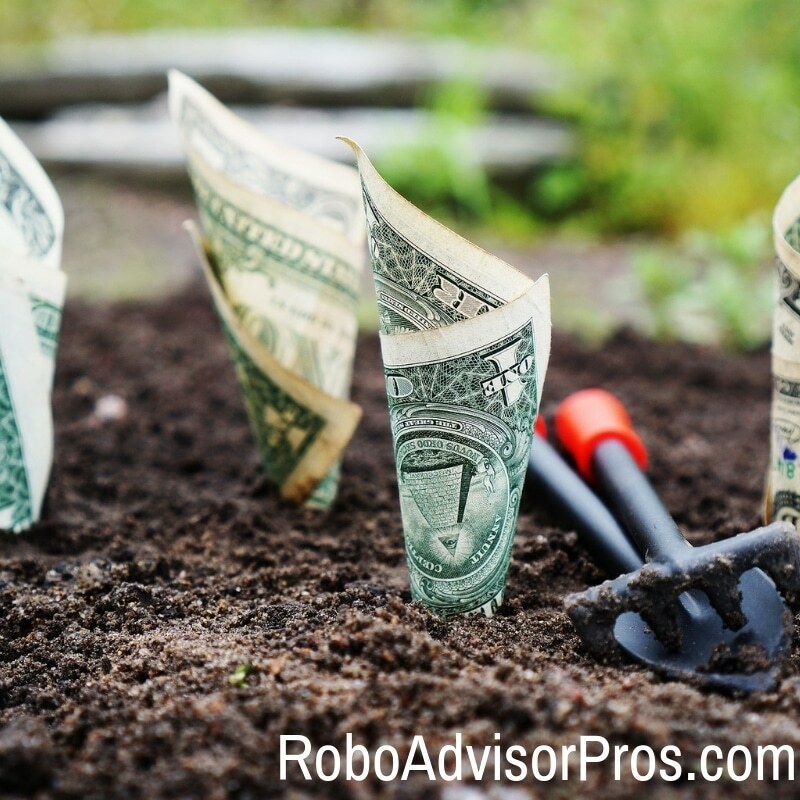 Before you flip a coin, there are some crucial differences between these robo-advisors you should be aware of. Overview A goals based automated investment advisor. Offers a variety of human financial planning options. A personally crafted robo-advisor investment portfolio guided by a human financial advisor. Premium-0.40% AUM up to $2 million. There may be additional commissions, transaction charges or other. Top Features Goal-based ETF investment portfolio. Rebalancing. Tax-loss harvesting. Socially responsible, smart beta + income portfolios. Human financial advisor access available. The human financial advisor drives the entire process. Together, you + the advisor create a customized investment plan. You can be as involved as little or as much as you'd like with your investments. The advisor monitors the plan. Rebalances your portfolio when needed. Investment Funds Low-fee, commission-free ETFs. Low-fee stock + bond mutual funds + ETFs selected from among the scores of Vanguard funds. Accounts Available Single + joint taxable investment accounts. Roth, traditional, rollover + SEP IRA. Trust. Individual + joint investment accounts. Roth, traditional, SEP, Simple + rollover IRAs. Trust. Betterment is certainly a good robo-advisor for many reasons, one of which is its affordability (which makes it great for millennial investors!). 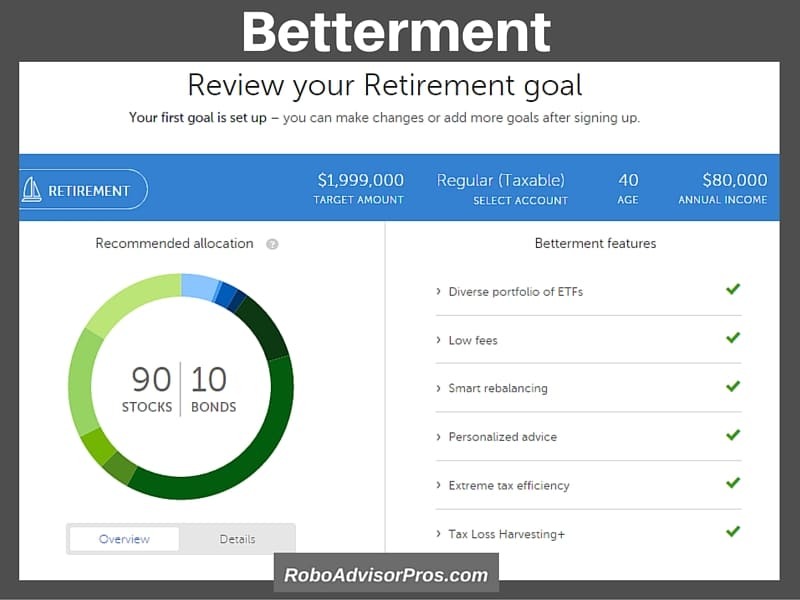 This robo-advisor allows clients to track their progress toward multiple financial goals. Additionally, clients can speak with financial planners at any account level! Vanguard Personal Advisor Services is a heavy hitter in the robo-advising world. This robo gives all clients access to personal financial planners, but it comes at a price: clients need $50,000 to begin a relationship with Vanguard. In exchange, however, investors can expect a hands-on, personalized experience at every step in the investment process. Betterment vs Vanguard Personal Advisor Services—Who Benefits? Betterment and Vanguard Personal Advisor Services each boast some of the most desirable robo-advisor features, including a human touch, reasonable fees, and portfolio review and rebalancing. The major differences in these top features are Vanguard’s commitment to keeping humans involved at every level of the process. While Betterment clients do have access to financial professionals, these professionals aren’t necessarily the ones analyzing, monitoring, and rebalancing portfolios. When it comes to the cost of these robo-advisors, however, Betterment is certainly more customizable. Clients can choose between different types of accounts, with distinct services and fees. Betterment offers one-time financial planning sessions to ensure investors are spending money only on the features they really need. These savings are reflected in reduced fees on AUM. Investors who want to customize their investment experience might choose Betterment over Vanguard Personal Advisor Services. Because Betterment is a goals-based robo-advisor and offers various account types and a la carte financial planning sessions, clients have a lot of control over what they pay for. Clients who want hands-on financial advice from a human professional throughout the entire investment process might prefer Vanguard. The flat fee of 0.30% of assets under management, provides clients with unlimited access to financial professionals who supplement the robo-advisor experience. As clients grow their accounts with Vanguard, they gain access to dedicated financial planners. Of course, the minimum balance requirements are something to consider. 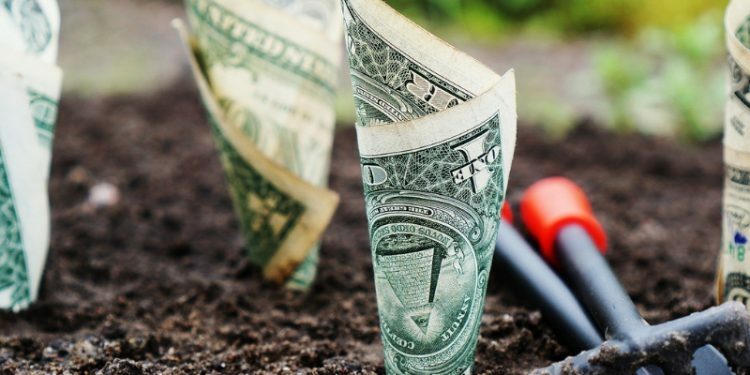 Investors with more money available upfront can go right to Vanguard; investors who want to start investing with a small amount of money will appreciate Betterment’s no minimum investment requirement. When it comes to Betterment vs. Vanguard Personal Advisor Services, which one is the better robo-advisor? While the answer to that question might depend heavily on each individual client’s needs, there are a few defining features that set these robo-advisors apart. Betterment and Vanguard Personal Advisor Services are vastly different in terms of minimum investment amounts: Betterment clients can open accounts with no minimum balance, while Vanguard clients will need $50,000 to start using their services. In terms of fees, however, the two robo-advisors are relatively well-matched! Vanguard charges a flat 0.30% AUM regardless of balance, although additional transaction fees or commissions may be charged. For investors with over $5 million invested with Vanguard, management fees decline. Betterment Digital clients pay 0.25% AUM, which drops to 0.15% AUM on accounts over $2 million. Betterment Premium clients pay 0.40% AUM or 0.30% AUM when accounts go over $2 million. Specific Betterment Financial Planning Packages range in price from $149 to $399. With both of these robo-advisors, clients can expect access to human financial advisors. 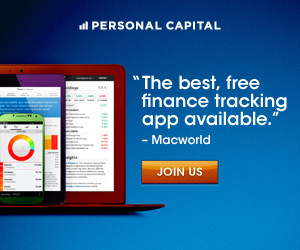 This is a huge selling point in the robo-advisor market, where autonomy is the name of the game. However, these robos differ in how much human interaction they provide and the cost of the personalized advice. For Betterment, human financial planners are available via text message at all levels, including the Digital level (which costs 0.25% of AUM). Betterment Premium customers qualify for in-person meetings with financial advisors. Their a la carte financial planning services, however, might be the best solution for many clients who need some short-term face-to-face advice. 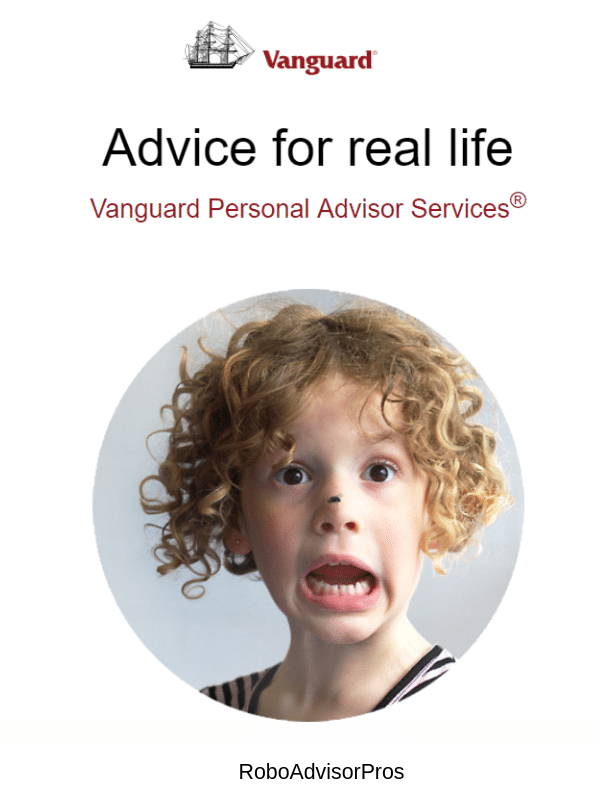 For Vanguard Personal Advisor Services, human financial planners are just part of the package. Clients have unlimited access to human financial planners who are hands-on throughout the entire process. For investors with at least $50,000, the 0.30% annual fee of assets under management (AUM), however, this might just be a better value than Betterment; Betterment Premium clients will need over $2 million in investments in order to have a 0.30% AUM fee. Betterment delves into diverse corners of the investment universe to capture various U.S. and international stock and bond funds. While Vanguard lists its core funds the only way to know the other investment funds they use is to open an account. Since Vanguard uses best practices investing and is known for low-fee funds, I would be confident in their fund offerings. I don’t consider the available fund choices to be an issue for either provider. You’ll get a diversified and balanced portfolio from either Betterment or Vanguard Personal Advisor robo-advisors. Betterment offers 8 bond ETFs spanning U.S. corporate, high yield, short term, municipal and treasury bonds. Additional bond categories include both developed and emerging market bond funds. Knowing the Assets Under Management (AUM) of your robo-advisor options can be important! Both Betterment and Vanguard Personal Advisor Services have high AUM, coming in the top five of all robo-advisors for AUM. Clients might be comforted to know that Vanguard has $115 billion (yes, billion) AUM, which demonstrates the robo-advisor’s strength. While Betterment isn’t very close to that number, coming in at “only” $16 billion AUM, this is still a sign that Betterment is a trusted robo-advisor! Is Vanguard Personal Advisor Services worth it? Absolutely. Is Betterment worth it? Yes it is. Each robo-advisor is a good choice, for the right investor. Both Betterment and Vanguard Personal Advisor Services are robo-advisor powerhouses. These robos demonstrate stability through their AUM numbers. They also stand out among other robo-advisors because they offer access to human financial planners as part of their packages. In terms of fees, these robo-advisors are well-matched; investors can expect to pay between 0.15-0.40% AUM depending on account type and access to premium features. Although investors who want to use Vanguard’s services will need to have a larger minimum investment amount, clients of either robo-advisor will have access to the basic features of any good robo, including, portfolio rebalancing, diverse investment options, and multiple account types.